In case you didn't know this about me, I'm a foodie. I know, shocker right!?! So when the new movie Burnt came out last weekend, my girls and I planned a special night of food and fun, and went to see it! Since this is a movie about a 2 Michelin Star chef, seeking redemption while going for three, we had to make things a little fancier than usual. That is where my Bacon and Blue Cheese Pasta came into play! As usual, with any pasta dish, the first thing you will need to do is bring a pot of salted water to a rolling boil. Now you will need to slice the bacon. Place the bacon into a COLD pot and turn on the heat to medium/high. Cook the bacon until crispy and brown. Once the bacon is crispy remove it from the pan and place on a paper towel. By now your water will be at a rolling boil. Add the rigatoni to the water and cook according to the instructions on the box. This called for 10 minutes. Now you can pour the heavy cream into the pan you fried your bacon in. Let the milk heat over a low flame until it just starts to bubble around the edges. Then add the Castello Danish Blue Cheese Crumbles. I love Castello cheese because "Since 1893, Castello has brought a range of innovation and tradition to the art of cheese making. Castello® cheeses are creatively crafted, and always made with natural ingredients and great attention to detail." Whisk the cheese into the cream until the cheese has melted and the sauce is smooth. Taste the Blue Cheese sauce for seasoning. This just needed a pinch of salt. Once your pasta is ready add it to your Blue Cheese Sauce. Toss everything around until it is well coated. Top with the crispy bacon, a little extra Castello Danish Blue Cheese Crumbles, pair with a great Cabernet Sauvignon, and girls movie night it is full swing! 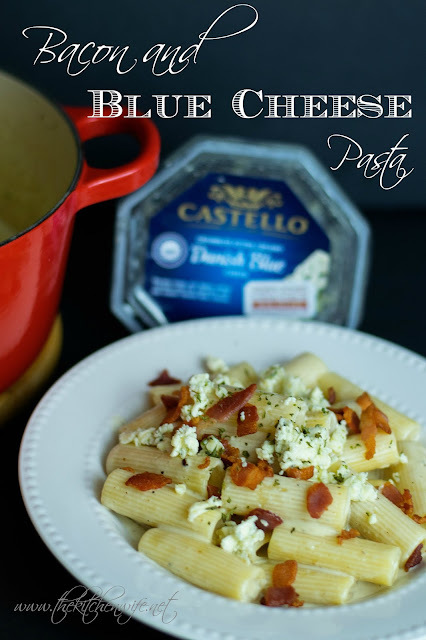 So this weekend get your squad together, and make this delicious Bacon and Blue Cheese Pasta or head on over to the Castello/Burnt Page for even MORE great recipes! Oh! And while you are there, be sure to enter the #UnlockYourChef Sweepstakes where you can win private cooking classed for two or a years supply of Castello's amazing cheeses! Have a great day everyone! Slice the bacon and add it to a cold sauce pot. Turn the heat to medium/high heat and cook until brown and crispy. Once cooked, remove the bacon from the pan and place on a paper towel. Add the pasta to the boiling salted water and cook according to the directions on the box. Pour the cream into the sauce pot. Add the onion powder, garlic powder, and pepper to the cream and whisk together. Heat the cream until it just starts to boil around the edges. Now add the blue cheese crumbles. Taste for seasoning and make any adjustment you feel is necessary. Once the pasta is cooked, drain and add to the blue cheese sauce. Toss until all the pasta is coated in the sauce. 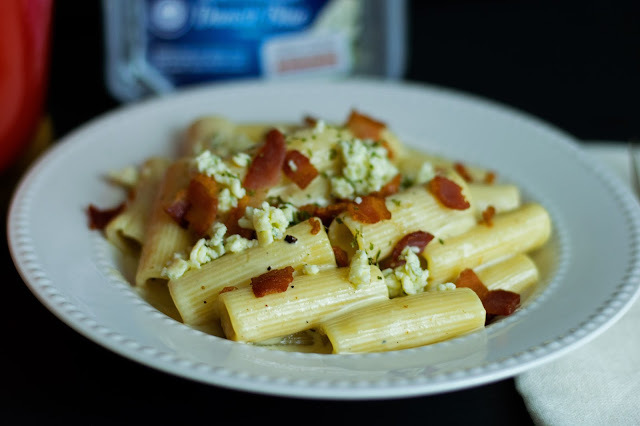 Serve, top with the crispy bacon, blue cheese crumbles, and enjoy! Looks fabulous! I know ya'll had a great time! Blue Cheese and Bacon! YUM!